Cleveland as long as Boston had the Big Three. He needed better talent. So when you can’t beat them, join them. Having lost faith in Dan Gilbert and the rest of the brass in Cleveland, he decided to “take his talents to South Beach” and formed a copy-cat Big Three consisting of Bosh, Wade and himself. The formation of the Heat’s Big Three followed a radically different model than the formation of the Celtic big three. Ex-Celtic teammates Danny Ainge and Kevin McHale were key players in the trade that sent the Big Ticket to Boston 5 years ago for a hoard of Celtic players, picks, and who knows what else. Boston also agreed to send KG’s teammate Wally Sczerbiak to Seattle (the third team in the trade) in a package that brought Ray Allen to the Celtics. The Celtics Big Three was forged the old fashioned way, via trades and back-room deals between the owners, the way teams were traditionally built. as if he head slayed the monster that had caused him so much pain. In hindsight, the Heat collapse in the Finals against Dallas seemed like an inevitable emotional downfall from having beaten Boston. LeBron still hadn’t suffered enough to win yet; it was as if the basketball gods still needed to exact more taxes from him before awarding him a championship. When Celtics Big Three surged again this year against all odds and took a 3-2 lead on LeBron’s Heat, James had had enough. He produced an epic playoff performance in Game 6 by scoring 45 points, 15 rebounds, 5 assists in nearly 45 minutes. He only sat down in garbage time, the damage inflicted upon the Celtics thoroughly complete. Game 7 proved to be quite an entertaining affair, completely unlike the Game 6 blowout The proud veteran Boston team held a lead at half and partly into the 3rd quarter. When Miami finally caught up in the middle of the third quarter, Boston held it together for another 8 minutes, as the game see-sawed back and forth. Miami finally got the upper hand on one of Chris Bosh’s innumerable three pointers to take an 88-82 lead with about 7 minutes of the fourth quarter. From then on, Miami’s Big Three scored all of Miami’s point. LeBron scored in all matter of ways during the critical stretch: dunking at the rim, raining a 30 ft jumper, shooting an off-balance bank-shot runner with Bass in his face. Even the much maligned Wade got into the act with a couple of big buckets down the stretch. Most importantly for the Heat, the best player of their Big Three, LeBron James, grew up by leaps and bounds in this Series. He dominated Game 6 like the best dominant players in NBA history. He is no longer afraid to take charge at the end of close games (such as Game 7 of this series and Game 4 of the Indiana series). He finally appears to have shed whatever insecurity he had. He is dominating like the greatest player in the world. together will increase the urgency to win their first this year. But after having conquered the Celtics team making their last run, they’re more battle tested than the Thunder. With a grown up LeBron, Bosh back to form, they should prevail in the Finals. The future of Boston’s Big Three is uncertain. Only Pierce is under contract. It’s rumored that Garnett may retire. As far as Allen, despite stating that his legs “had years of basketball left”, he may opt that those years be with someone else. I’m finally glad that the Big Ticket got his ring. Forget all of the metrics, the plus/minus, points, rebounds, scoring efficiency, and other “moneyball” style metrics that have come to rule out the way games are analyzed today. 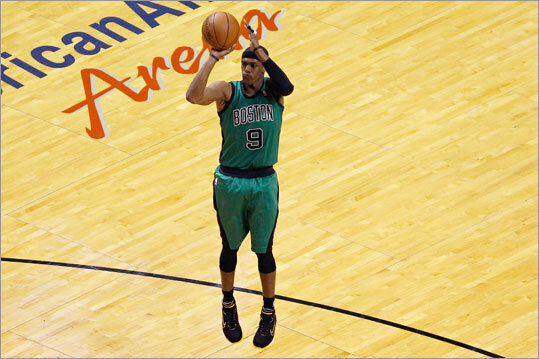 Game 5 between the Celtics and Heat can best be understood by one single thing: good old fashioned will to win. No one player exemplifies this better than Kevin Garnett, who dominated Game 5 playing like his 2004 MVP old self. As a collective whole, Boston has more players that can exert their will on their opponents than the Miami Heat do. Michael Jordan was the absolute master of harnessing negativity into an overwhelming positive force. You’d block Jordan, and he’d come back and drop 20 unanswered on you. You’d steal the ball from him, and he’d come back and dunk on you 3 three straight times. You’d win a game and start to believe you could beat his Bulls, and the next night he’d bury your hopes right in front of your eyes. Just ask Barkley, Malone, Stockton. This Series is actually best seen through an analysis of 5 key sequences. In the early going of this Series, Miami was getting their way. In Game 1, after LeBron drove the lane and scored against KG, he picked the ball up and held it out laughing out loud. Garnett sneered at him but could do nothing about it, knowing he’d been beat. Time to harness the negativity. In Game 2, Wade drove the lane on KG in the overtime and scored a 2 and drew the foul while Garnett just stared. Time to harness the negativity. In Game 3, KG was fouled hard by Haslem and landed on his back with a thud. After regaining his senses, he didn’t stand up, but instead did eight bare-knuckle pushups. The Celtics didn’t look back after that and won Game 3. In Game 5, Pierce, who had had a terrible shooting night, nevertheless worked an opening on LeBron with the game on the line and canned a 3 pointer to extend a 1 point to lead to 4 int he final minute of the game. The Celtics have gone from the 6% to the 84% in the span of their three game winning streak. But that’s only for those that are enslaved by stats. My intuition says that the Celtics close this out in Boston simply because they want it more than Miami. Clutch is Pierce putting up a three pointer in LeBron’s face to extend the lead to 4 in the closing minute. Clutch is Kevin Garnett running on a fast break, recognizing that LeBron didn’t want any part of him, and throwing it down. Clutch is Kevin Garnett blocking a LeBron drive to the basket. Clutch is Rondo outjumping LeBron for a loose ball and tipping a perfect pass to a wide open Pietrus in the corner for a killer trey. Clutch is what you do in the end of a close game, when it matters. Clutch are the 2012 Boston Celtics. If you were wondering what the Celtics were made of, if they possibly had enough energy left after losing a heartbreaking Game 2 to make this a series, well wonder no more. There was legitimate concern of a mental collapse after losing a game in Miami that they dominated throughout; could this veteran team (read old) could really stand up to the new big bad kid on the block, would they really have the legs to stand up and deliver ? The question was answered in a decisive home stand in which the Celtics won both games, one decisively (Game 3), and one that they eeked out in overtime. Fueling off the potent mixture of the legacy of the franchise and a raucous crowd, Boston was able to even up the series to make this a best 2-3. More importantly, the Celtics have to feel good after basically outplaying the Heat in three straight games, and their mindset now is that it is they could be up 3-1 with a chance to close out the Series after basically outplaying the Heat in 3 straight games. Moreover, all of the pressure is on Miami, everyone’s preseason favorite to win it all. Boston, was after all, too old and too beat up to even have a chance. Miami started aggressively, as if trying to deliver the coup de grace early. James scored a bunch of points early, raining jumper after jumper and Miami took an early 28-22 lead. But then the Celtics roared back, using a 15-0 run at the end of the first and start of the second quarter. Fueled mostly by the energy of reserves Keeyon Dooling and little used Marquis Daniels, they overtook the Heat with that run and never looked back. The Celtics established KG early and often, Rondo hitting him in the post with a number of passes that led to easy dunks and short-range shots. One play was special. After being whackede by Haslem while attacking the basket, KG landed hard his back. He lay there for a few seconds grimacing, then flipped over and then did 8 bare knuckle pushups, a moment that not only inspired his team, but may prove to be another iconic moment in the long Celtic lore if Boston is able to win the Series. Paul Pierce was also more aggressive early on, hitting his trademark jumpers and used his array of moves. Most importantly was his ability to draw 3 fouls on Le Bron James before halftime. One in particular was vintage Pierce. He pumped fake, got LeBron into the air, then jumped into him while throwing the ball at the basket. The glue to it all was the play of Rajon Rondo. Rondo played another impressive game by playing the role of a pure point guard than that of a pure scorer. His statistical tally of 21 points, 10 assists, 6 rebounds was impressive but it was how he established overall control of the game, facilitating a scoring balance amongst both starters and reserves, that was the reason the Celtics win this game. Kevin Garnett scored 24 points, Pierce 23, Allen 10, Dooling 7, and Daniels 9. After an impressive first quarter, Miami was outscored 55-35 in quarters 2 and 3, before mounting a roaring comeback that fell short in the fourth. Trailing by as many as 24 points, the Heat got back to within 5 before Boston made the last push. James played brilliantly (34 points, 8 rebounds, 5 assists), but Wade was held to 18 on 9-20 shooting. While Chalmers added 14, the rest of the Heat scored only 24 points. Every single Heat player except for those who played in garbage time was in the negative plus/minus column. Game 4 was a tale of two halves. Boston raced out to a large lead (21-6), led by as many as 18 points. Boston would end up scoring 61 points in the first half en route to a 14 point lead, but then were outscored by the Heat 42-28 in the following 29 minutes including the overtime. It was barely enough to prevail 93-91. In that sense, it mirrored Game 2, with Boston racing out to a big lead, and eventually unable to hold of Miami which forced an overtime. But unlike Game 2, Miami wasn’t able to get it going int the extra period. The Heat scored only 2 points from a Haslem dunk in a period that saw both Le Bron and Pierce foul out on dubious calls. Boston’s stingy defense was the reason for the victory, forcing Miami into yet another series of mistakes on the offensive end. And in the end, with LeBron out of the game, Miami’s Wade was able to pump fake Daniels out of the way for a wide open look. The shot missed and instead of Miami having a dominant 3-1 lead going home, the series was alll knotted at 2 apiece. Boston’s unlikely hero during the overtime was Mickael Pietrus, who got two key offensive rebounds and was able to maneuver into the lane enough ahead of LeBron James to draw the foul that disqualified James. Pietrus didn’t score a point in the entire game but the two rebounds (a category the Celtics are notoriously weak at) allowed Boston to control possession of the ball in a dismally low scoring overtime. With James out, Miami was visibly out of their comfort zone, and even though Wade got a good look, he just missed it. Which brings us to Game 5. It is now clear that these two teams are very evenly matched and it is the bench that is going to decide who goes to the Finals. Neither of these teams’ benches “games travel well.” Whichever bench makes the first adjustment to get that first road win should prevail in this series. They played with the desperation of the 6%, with the knowledge that falling into a 0-2 hole would prove to be too gigantic of an obstacle to overcome. They played with intensity, focus, aggressiveness, and desperation. And one man above all, Rajon Rondo, played the game of a lifetime. No matter, the Heat took the Celtics best punch but did not get knocked out. The Heat’s two stars Wade and LeBron are just too thick and strong. In the end, it was they that came back and delivered what could have been a blow too difficult to overcome. 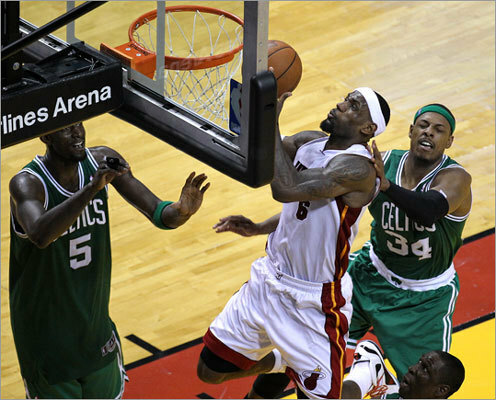 The fight’s not quite over, but with Miami prevailing in overtime in Game 2, its the Celtics that are now on the ropes. In NBA playoff history, only 6% of teams facing a 0-2 deficit have rallied to win a 7 game series. The odds are even more against this particular Boston team due to their razor thin roster, a team which has been depleted by injuries throughout the course of the season. It was those two factors that inspired Boston’s to perhaps its best performance of these playoffs, and even then it wasn’t enough. It was the Heat that proved to be more resilient, coming back twice against the Celtics in a thrilling see-saw game. Rondo played the game of his life. A notoriously weak shooter, he tallied 44 points (on 16 of 24 shooting from the field), 10 assists (to three turnovers) and eight rebounds. He carried the Celtics on his back and nearly won the game single-handedly, scoring all 12 points in overtime. On a team that is barely alive and certain to be dismantled next year, he proved (along with his incredible performance in last year’s playoffs against the same Heat team after dislocating his elbow) that he has both the talent and toughness to go with his other unique set of skills. A player who was on the trading block just 2 months ago, Rondo has now cemented his status as the player the Celtics should build around. Rondo was involved in the most controversial play of the night. With the game tied at 105 in overtime, he drove the lane and was obviously fouled across the head by Wade. No blood, no foul. The Heat went back the other way and took a 2 point lead. On the following Heat possession, Wade used a screen by James to drive past Rondo before running in a three-point play while being knocked down by Garnett. Wade glared up at Garnett as he got back on his feet, and then he made the free throw to make it 110-105 with a minute left. That play also had some controversy as the debate raged whether KG fouled Wade before Wade kicked KG. The 6 point turnaround in a close game unhinged the Celtics. While Rondo had to be restrained when he tried to go after the official, Boston GM Danny Ainge did not hold back, going after the NBA VP of refereeing operations Joe Borgia. LeBron James went to the line 24 times while the entire Boston team went only 29 times. The foul disparity aside, it was the non-call that proved decisive. Look for the Celtics to get a lot more calls at home for Game 3. So Boston can get back in this ? What will they have after having spent so much energy and emotion in the Game 2 loss ? Can they overcome the two Heat superstars and also keep the Heat bench at bay ? While I agree with what Rivers said, I don’t think the Celtics can win the Series. I think they can win Game 3, but not 4 out of 5 from Miami. I would believe if they had Avery, and Green, and Wilcox, and O’Neal. Hell I’d believe a lot more if they just had Avery back.